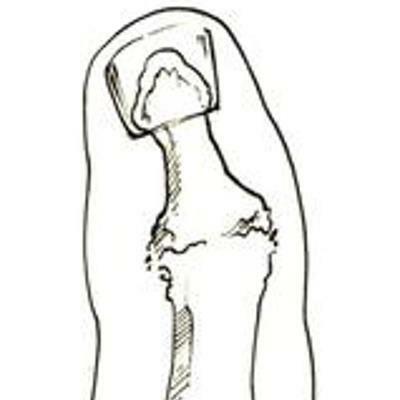 The terminal joint of the finger is called the distal interphalangeal joint (DIPJ) (see diagram). Osteoarthritis often affects these joints, and can also affect the joint at the base of the thumb (Basal thumb arthritis). Osteoarthritis is loss of the smooth cartilage surface covering the ends of the bones in the joints. The cartilage becomes thin and rough, and the bone ends can rub together. Osteoarthritis can develop at any age, but usually appears after the age of 45. It may run in families. Many people notice small bony bumps on the back of the joint. These are osteophytes, which are bony swellings associated with an osteoarthritic joint. In the finger they are called Heberden's Nodes. Joint replacement using a flexible silastic hinge is now a possibility and your surgeon can advise you about its indications and potential complications.